In the farmdoc daily article of April 6, 2016 we offered a new specification for the relationship between the marketing year ending stocks-to-use ratio and the marketing year average farm price for corn and soybeans. Forecasting the marketing year average price using the new stocks-to-use and price model is a two-step process. The stocks-to-use ratio must be projected first and then the appropriate scenario for demand has to be specified. Here, we illustrate that two-step process for the 2016-17 marketing year using two alternative balance sheet projections for corn and soybeans. Based on this analysis, we draw broader conclusions about the likelihood and drivers of lower and higher prices. 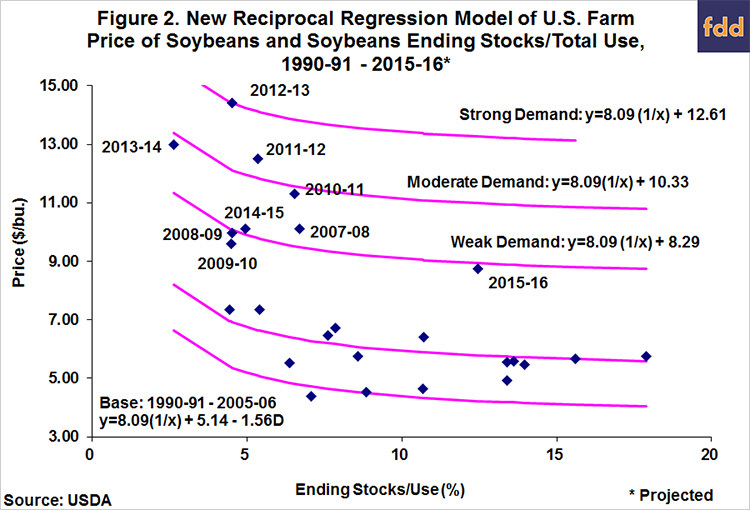 In our article last week (farmdoc daily, April 6, 2016), we estimated a base reciprocal regression model of the U.S farm price of corn and soybeans and the ending stocks-to-use ratio for the period 1990-91 through 2005-2006, skipped 2006-07 as a transition year, and then estimated relationships after 2005-06 that are exactly parallel to the base period model. In the new model, we assumed the slope is unchanged between the base period and relationships after 2005-06, but the intercept varies in the latter period to reflect demand shifts that occurred after 2005-06. The years after 2005-06 were grouped into four demand scenarios for corn (weak, moderate 1, moderate 2, and strong) and three demand scenarios for soybeans (weak, moderate, and strong). 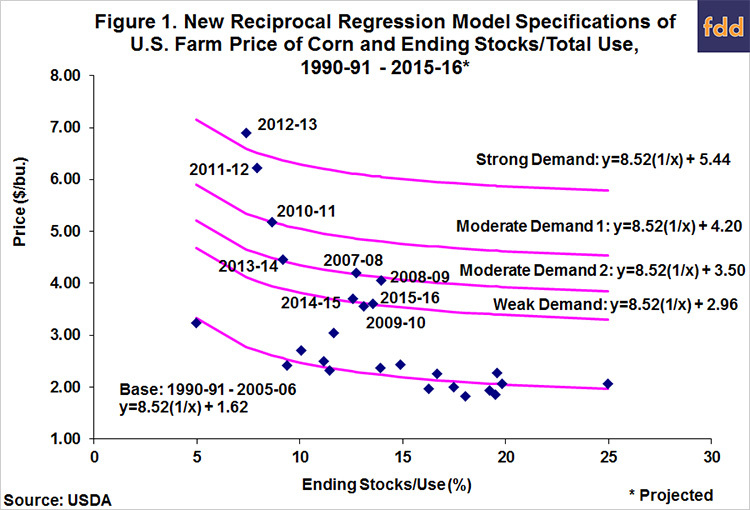 This specification differs from previous model specifications that fit a regression to the stocks-to-use for two different time periods for corn (1990-91 through 2005-06, and 2007-08 through 2015-16) and one time period for soybeans (1990-91 through 2015-16). Figures 1 and 2 repeat the stocks-to-use and price models for corn and soybeans, respectively, presented in our recent article. We refer the reader to that article for a detailed discussion of the new models. Note that the most recent two marketing years for both corn and soybeans belong to the weakest demand scenario post-2005-06. It is also interesting to observe that this weak demand scenario also includes marketing years during the Great Recession of 2008-09. This provides important perspective on the magnitude of demand weakness in recent years. As indicated above, forecasting the marketing year average price using the new stocks-to-use and price model is a two-step process. The stocks-to-use ratio must be projected first and then the appropriate scenario for demand has to be specified. Here we illustrate that two-step process for the 2016-17 marketing year using two alternative balance sheet projections for corn and soybeans (Tables 1 and 2). 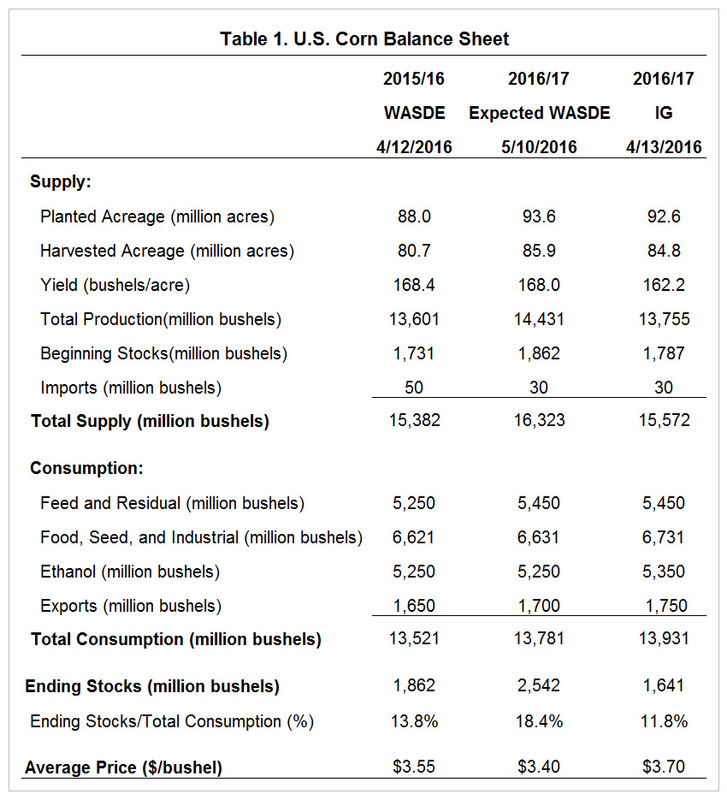 In each table, we first show the USDA supply and consumption balance sheet projections for the current marketing year (2015-16) as presented in the April 12, 2016 WASDE report as a starting point for 2016-17 projections. 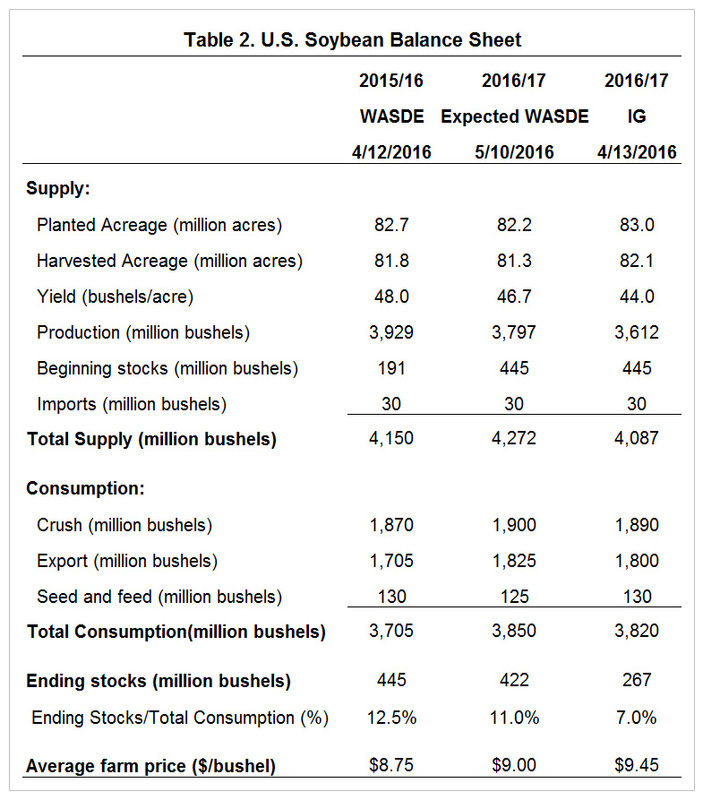 The first balance sheet scenario for the 2016-17 marketing year is based on our expectations of the USDA projections to be contained in the first USDA WASDE projections to be released on May 10. The second balance sheet scenario is based on our current forecast of the likely balance sheet for 2016-17. In the anticipated USDA balance sheet, planted acreage is assumed at the level indicated in the March 31, Prospective Plantings report. Harvested acreage of each crop reflects the difference between planted and harvested acreage projected in the USDA balance sheets presented in the Grains and Oilseeds Outlook at the February USDA Outlook Forum (7.7 million acres for corn and 900,000 acres for soybeans). The expected yields are the trend yield calculations used in those USDA balance sheets. For corn, the projection of ethanol use of corn is 25 million bushels larger than used at the Outlook Forum to reflect the subsequent increase in projected use for the current year. The projection of feed and residual use of corn is 25 million bushels larger than presented at the Outlook Forum, even though projected use in that category for the current year was reduced by 50 million bushels in the April WASDE report. A larger crop projection than used at the Outlook Forum justifies a larger projection of residual use of corn next year. For soybeans, the consumption projections are identical to those presented at the Outlook Forum. The expected May 10 WASDE balance sheets point to year ending stocks of 2.542 billion bushels of corn and 422 million bushels of soybeans. The second scenario for the 2016-17 balance sheets for corn and soybeans (IG) reflects our current expectations about how acreage, yield, and consumption may differ from the expected USDA balance sheet to be released on May 10. For corn, the second scenario reflects expectations of one million fewer planted acres as producers respond to changes in relative prices since the survey of acreage intentions was conducted. The difference between planted and harvested acreage of corn is 100,000 acres larger than expected to be projected by USDA due to larger planted acreage than expected in February and the tendency for the difference to be slightly positively correlated to the magnitude of planted acreage. The U.S. average yield rarely equals trend value. While there is certainly potential for the average yield to exceed USDA’s trend projection of 168 bushels, our current expected yield is 5.8 bushels below the USDA’s trend projection. The expected yield is based on our farmdoc daily article of March 2, 2016, where trend yield for 2016 was calculated at 166.2 bushels per acre and then adjusted down four bushels to reflect the increased risk of below trend yield due to the current rapidly fading El Niño episode. Smaller stocks at the beginning of the marketing year reflect our expectations that feed and residual use of corn and ethanol use of corn during the current marketing year will exceed the current (April 12) USDA projection by a total of 75 million bushels. Our projection of marketing year corn consumption varies from the expected USDA projections. The projection of ethanol use of corn is 100 million bushels higher than that anticipated by USDA since we have a higher expectation for the current year as well as expectations of continued increase in domestic gasoline consumption. In addition, our forecast of 2016-17 marketing year corn exports is 50 million bushels higher as currency values realign and as some production concerns in Brazil are beginning to emerge. On net, our current expectations result in projected marketing year ending stocks of only 1.641 billion bushels, 901 million bushels less than expected to be projected by USDA. For soybeans, the second scenario for 2016-17 reflects our expectations of 800,000 more planted acres than indicated in the Prospective Plantings report as producers respond to changes in relative prices since the survey of acreage intentions was conducted. The difference between planted and harvested acreage of soybeans reflects the declining trend in abandoned acres since 1996 and is equal to that expected to be projected by USDA. While there is certainly potential for the average yield to exceed USDA’s trend projection of 46.7 bushels, our current expected yield is 2.7 bushels below the USDA’s trend projection. The expected yield is based on our farmdoc daily article March 9, 2016 which calculates trend yield for 2016 at 45.2 bushels per acre and then adjusts this down by 1.2 bushels to reflect the increased risk of below trend yield due to the current rapidly fading El Niño episode. Our projection of 2016-17 marketing year soybean consumption is slightly smaller than expected USDA projections. The more conservative projections reflect on-going competition from large South American soybean and soybean meal supplies. On net, our current expectations result in projected marketing year ending stocks of soybeans of only 267 million bushels, 155 million bushels less than expected to be projected by USDA on May 10. The alternative balance sheet projections allow for alternative price projections for the 2016-17 marketing year using the pricing models in Figures 1 and 2. For corn, the projected ending stocks-to use ratio is 18.4 percent for the expected USDA scenario and 11.8 percent for our current scenario. If corn continues in a weak demand environment, then the relevant pricing model is y = 8.52(1/x) + 2.96, where y is the farm price of corn and x is the stocks-to-use ratio. This pricing relationship would point to average corn prices of about $3.40 and $3.70 for stocks-to-use ratios of 18.4 and 11.8 percent, respectively. For soybeans, the alternative scenarios point to an ending stocks-to-use ratio of 11.0 percent for the expected USDA scenario and 7.0 percent for our current scenario. If soybeans continue in a weak demand environment, then the relevant pricing model is y = 8.09(1/x) + 8.29, where y is the farm price of soybeans and x is the stocks-to-use ratio. This pricing relationship would point to average soybean prices of about $9.00 and $9.45 for stocks-to-use ratios of 11.0 and 7.0 percent, respectively. The flat slope of the reciprocal regression price models over a fairly wide range of stocks-to-use ratios means that relatively large differences in ending stocks projections result in relatively small differences in the projections of marketing year average price. Even larger ending stocks than projected here would reduce the price projections by a small amount, assuming we continue in a weak demand environment. For example, a stocks-to-use ratio of 25 percent would only lower the price of corn to about $3.30 per bushel. As a result, the risk of lower average corn and soybean prices than projected under the expected USDA balance sheets appears minimal. Under the weak demand scenario, the projected ending stocks-to-use ratio for corn would have to be less than 8.2 percent to result in a price forecast above $4.00. Assuming everything else unchanged in our current projected scenario (IG), the U.S. average yield would have to be less than 156 bushels to drop the ending-stocks-to-use ratio to 8.2 percent and increase the price projection above $4.00. This would represent a yield decline of at least 6.2 bushels from our El Niño influenced projection of 162.2 bushels and a decline of at least 10.2 bushels from our trend yield projection of 166.2 bushels. A 10 bushel drop below trend yield has certainly occurred in the past but only about 11 percent of the time (farmdoc daily, March 2, 2016). Even if the risk is larger this year due to El Niño influenced summer weather, yield declines of this magnitude would be relatively infrequent. Under the weak demand scenario, the projected ending stocks-to-use ratio for soybeans would have to be less than 4.7 percent to result in a price forecast above $10.00. All else unchanged in our projections (IG), the U.S. average yield would have to be less than 43 bushels to drop the ending-stocks-to-use ratio to 4.7 percent and result in a price projection above $10.00. This would represent a yield decline of at least 1.0 bushels from our El Niño influenced projection of 44.0 bushels and a decline of at least 2.2 bushels from our trend yield projection of 45.2 bushels. A 2.0 bushel drop below trend yield has certainly occurred in the past but only about 18 percent of the time (farmdoc daily, March 9, 2016). If the risk is larger this year due to El Niño influenced summer weather, yield declines of this magnitude could occur with a moderate frequency. Substantially higher prices than projected under our current expected supply and consumption scenario (IG) would likely require an improvement in the overall demand environment. Under the moderate 2 demand conditions for corn, our ending stocks-to-use ratio projection of 11.8 percent would result in a projected average price of about $4.25 per bushel. Alternatively, an ending stocks-to-use ratio of 17 percent or less would result in a projected average price above $4.00 under moderate demand 2 conditions. Under moderate demand conditions for soybeans, prices would be projected above $10.00 for all levels of stocks, and at our ending stocks-to-use ratio projection of 7.0 percent the projected average price would be about $10.50 per bushel. Using new ending-stocks-to-use pricing models (farmdoc daily, April 6, 2016), we conclude that the probability of the 2016-17 marketing year average farm price of corn and soybeans to be below $3.40 and $9.00, respectively, appears to be quite low at this time. For perspective, substantially lower prices would require a demand environment even weaker than occurred during the Great Recession of 2008-09. A more interesting question revolves around the conditions required to increase the average price to levels that would be considered profitable for most producers. If overall demand remains weak, prospects of very small year ending stocks would likely be required to move averages above $4.00 and $10.00 for corn and soybeans, respectively, which would be helpful but would not represent a return to general profitability. However, there are factors that could improve the demand environment in the year ahead. These include crop production problems in other parts of the world that would extend the demand for U.S. corn and soybeans, a realignment of currency exchange rates that would favor U.S. corn and soybean exports, and policies that enhance the domestic demand for corn and soybeans. Recent dryness that poses, or may pose, some threat to the Malaysian palm oil crop and the second-season Brazilian corn crop are examples of production problems that would enhance export demand. The current biofuels policy that is supporting biodiesel production also has the potential to support soybean oil consumption at a higher level. It is interesting that the futures markets may already be anticipating some of these developments, as the markets are currently projecting 2016-17 marketing year average prices of about $3.70 for corn and $9.40 for soybeans. Irwin, S., and D. Good. "The Relationship between Stocks-to-Use and Corn and Soybean Prices: An Alternative View." farmdoc daily (6):66, Department of Agricultural and Consumer Economics, University of Illinois at Urbana-Champaign, April 6, 2016. Irwin, S., and D. Good. "Forming Expectations for the 2016 U.S. Average Soybean Yield: What About El Niño?" farmdoc daily (6):46, Department of Agricultural and Consumer Economics, University of Illinois at Urbana-Champaign, March 9, 2016. Irwin, S., and D. Good. "Forming Expectations for the 2016 U.S. Average Corn Yield: What About El Niño?" farmdoc daily (6):41, Department of Agricultural and Consumer Economics, University of Illinois at Urbana-Champaign, March 2, 2016.